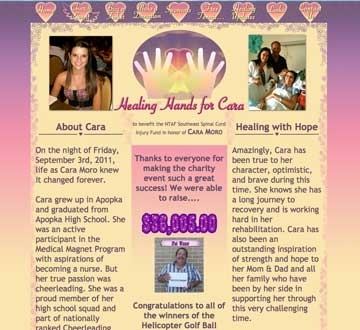 Please extend your healing hands for Cara. On the night of Friday, September 3rd, 2011, life as Cara Moro knew it changed forever. While doing a cheerleading stunt with a friend, Cara fell and broke her back. She was rushed into a 5+ hour surgery at Shands Hospital in Gainesville, but sadly the tragic accident left Cara paralyzed from the waist down. This site was created to assist Cara through donations via the NTAF Southeast Spinal Cord Injury Fund in honor of Cara Moro.